Adventures Galore Great Aussie Holiday Park is an outdoor adventure playground. 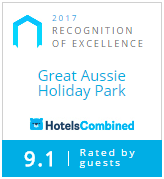 The best caravan park in Albury Wodonga NSW. The holiday park has been specifically designed to ensure you never run out of things to explore! Playground – Large playground suitable for all ages. Tennis Court – Bring your own tennis racquets or use ours. Pump Bike Track – This has been voted one of the kid’s favourite things to do. Jumping Pillow – Endless fun from morning until night. Games Room – A range of indoor games for everyone. Badminton – Why not create your own tournament with friends & family. Golf Driving Range – For those golfing enthusiasts. Movies – Relax, kick back and watch a movie or two. Swimming Pool – Enjoy our outdoor spacious and clean swimming pool or relax around the pool under the shade of our sail. Recreation Room – Perfect for days that might be a bit wet and there are plenty of games to play. Recreational Bush Track – Enjoy the bush at your own pace. Splash Park – A splashingly fun way to keep cool on hot days. Volley Ball – Great fun out in the fresh air overlooking the lake. Kids Club – Always something different to do and the kids never want to leave. Lake Hume – Swimming, fishing, and watersports. Hume Hovell Track – Check out the track from Tunnel Road to Hovel Tree Park. Woomargama National Park – The largest protected area of forest west of the Great Dividing Range. This place is great for hiking and 4WD touring.